Should I Apply "Early Decision"? Should I Apply Early Decision? Early Decision (or ED) is a binding agreement between a student and their ED school. A student admitted in the ED round (usually in mid-December) must retract all other applications and make a deposit to the ED school. The trend in applying ED is on the rise. Who normally applies Early Decision? Why is it easier to get into a school by applying ED? Recruited athletes who apply ED are nearly guaranteed to get accepted because they have support from the athletic department and are often pre-screened. Because of the early submission dates, ED applicants tend to be more organized, accomplished, and motivated than their RD counterparts. ED applicants often have a parent(s) who attended the school which can sometimes tip the scales in favor of the student. The more ED students a college accepts, the higher their yield (the percentage of students who get admitted who actually enroll). Accepted ED students must pay whatever the school says is appropriate. There is no negotiation of financial aid packages. Schools assume that students who apply ED really want to attend (aka demonstrated interest). Schools find it easier to manage their enrollment with a high percentage of ED admits. 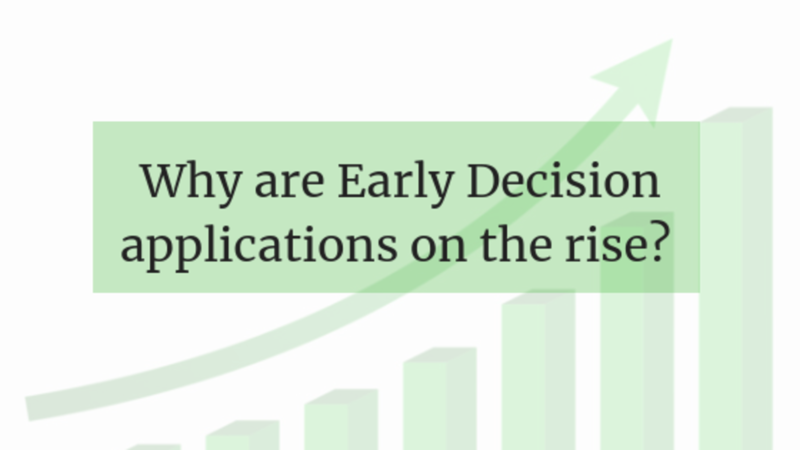 ED application readers may be more energized and alert while assessing ED applications. By the time RD applications come around - they have seen it all. Who should NOT apply ED? Students who think the higher acceptances rates in the ED round will make up for a subpar application. It won't. Students who apply ED just to "get it over with"
Why is it getting so scary to wait for the Regular Decision round? Well, because of the popularity of ED, it's becoming even tougher (if that's possible) for those who wait until the RD round - especially at competitive schools. Let's look at case studies from University of Pennsylvania and Bowdoin College. With about a 50% male/female split, about 16,000 male applicants in the RD round were vying for one of 1,100 male spots (7%). About 16,000 female applicants faced similar odds in the RD round. Since Bowdoin College enrollment is also close to a 50% male/female split, about 3,600 male applicants in the RD round were vying for one of 371 male spots (10%). The same goes for about 3,600 female applicants in the RD round (10%). Are you a recruited athlete with a "support letter" from a coach? Is this your absolute dream school (bar none)? Can you comfortably afford the school no matter what the financial aid package looks like? Have you visited the school in-person? Will you be ready to submit your best application by Nov 1? Are you a VERY competitive ED applicant that's not trying to use a higher ED acceptance rate to make up for an average application? If you can answer yes to one or all of these questions, ED may be for you. Be careful about reaching for an ED school that's too aspirational. Remember, you only get one shot at an ED school. If you over-reach and don't get in, then you may have to lower the selectivity of the schools on your RD list, because of how competitive RDs have now become. This is a very tough balancing act. That's why I created PrepWell Academy and why I advise students and families about the subtleties of the system. Author: PrepWell Academy's Founder, Phil Black, has spent a lifetime cracking the code on the world's most competitive programs: Yale University, Harvard Business School, Navy SEALs, Goldman Sachs, Entrepreneurship, Shark Tank, etc. PrepWell Academy is an online mentoring program that immerses teens in a variety of experiences and opportunities. In doing so, it helps them find and pursue their passions in a way that will not only make them extremely compelling college applicants, but also young adults who are well equipped to face life's future challenges. Black's specialties include military service academies, ROTC scholarships, Ivy League admissions, and student-athletes. © 2019 PrepWell Academy, Inc.